Do you enjoy snapping photos or taking movies of your adventures? 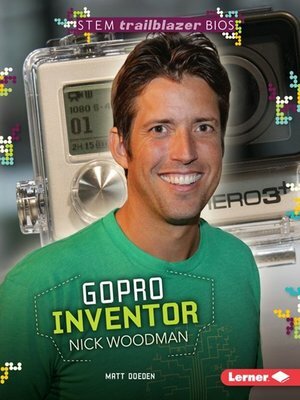 So does Nick Woodman—but when he was growing up, most of his activities weren't camera-safe. Woodman was a diehard surfer. He couldn't hold a camera—or keep it dry—while he was boarding. So many of his memorable moments went unrecorded. As an adult, Woodman set out to invent a camera that's easy to use anywhere. The result was GoPro—a company that builds sturdy, waterproof, wearable cameras. GoPro cameras have been used everywhere from the ocean floor to outer space. They've captured athletic thrills, exotic journeys, and everyday moments on the go. Discover how Woodman turned his tech vision into reality.